We aim to keep it simple and straightforward for our customers. We don’t like fine prints and nor do we like putting our customers through fine prints or legal jargons that are beyond your understandings or ours for that matter. We strive to meet your expectations and provide the best printer supplies and service. If you require any clarification or discuss anything to do with your order or the use of this website, we would love to hear from you. You can email us or call us directly on 0208 123 3461. You/Your - means any person or company using this website, submitting an order on this website. The terms and conditions below form the basis on which you can make a purchase with www.qualitycartridge.co.uk and use the site. By submitting an order with us, it is assumed that you accept the terms and conditions of purchase and use set by Dog Ink Ltd.
the contents of this site is purely for general information purposes and does not claim to be a or constitute legal guideline of any sort of form. All content and information published on it that form the intellectual property of www.qualitycartridge.co.uk is the sole ownership of Dog Ink Ltd. All works are protected by copyright laws and treaties. All such rights are reserved. You must not modify any intellectual property in any way and not use any content for any personal or commercial use without obtaining a a license to do so from us or our licensors. 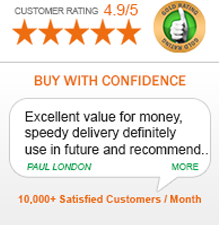 It is purely to be used for making an informed decision to purchase goods sold on www.qualitycartridge.co.uk. When you submit an order with us or register an account with us, you will be required to choose an email address and a password of your choice. You accept responsibility for all visits and transactions made under these credentials. If at anytime you feel your credentials are compromised, we request you to change password immediately. If for any reason your billing or delivery address needs changing, please update so under your account information. If this occurs between an order submission and delivery, please contact us immediately. Dog Ink Ltd reserves the right to accept, refuse or limit your order for any reasons that may include but not restricted to unavailability of goods, fraud review or errors in pricing and/or description. Orders will only be shipped to verified addresses. Please visit our delivery page for specific options and information on shipment. We aim to deliver goods on time and in the right condition. However, any selected time and date for delivery specified is an estimate only and thus not to be relied upon. We strive to achieve the delivery dates possible in our capacity. On purchase, the ownership, risk and liability of the goods supplied will be passed on to you on possession or to the carrier or the place of nominated delivery by you. We do not accept any responsibility for loss or theft or damage occurring thereafter. VAT will be clearly displayed on the bill and will have to paid in full on purchase of the goods. Your tax status will be a matter of between the tax authorities and you. Payment, unless, otherwise specified is to be made in full for an order to be processed. Orders are fulfilled subject to availability. In an unlikely event where we are unable to supply your request, you will be informed as soon as possible. You will be offered an option for a full refund or hold payment until the availability of the ordered goods. For 30 days credit accounts, terms of payment will be agreed and defined at the time of account opening. Please visit our Credit-Account page for more details. Our liability is limited to the price paid for the item that may have incurred the liability. We do not entertain or permit misuse of our site by knowingly introducing viruses, trojans, worms, etc which is malicious and harmful. You must not attempt to gain unlawful and non-permitted access to our site, server or any hardware/software connected to our site. By breaching this provision, you will be committing a criminal offence under the law and will be reported to relevant law enforcement authorities. In such event, your right to use our site will be terminated immediately. QUALITY CARTRIDGE and the logo is a UK registered trade mark of Quality Cartridge, Dog Ink Ltd. If you have any concerns about material which appears on our site, please contact us immediately. If you have ordered an item that you no longer require, you are able to return the item to us. Your item must be in its original unused condition to be returned for a refund or replacement. You must return this item to us within 30 days of the purchase date. Please inform us before returning any item so we can provide you with a Goods Return Number (GRN).